“[Donald Trump’s] ‘maximum pressure’ is impeding aid efforts by the Iranian Red Crescent to all communities devastated by unprecedented floods. Blocked equipment includes relief choppers,” he said on Twitter. Pompeo responded with an attack on Iranian government failings. 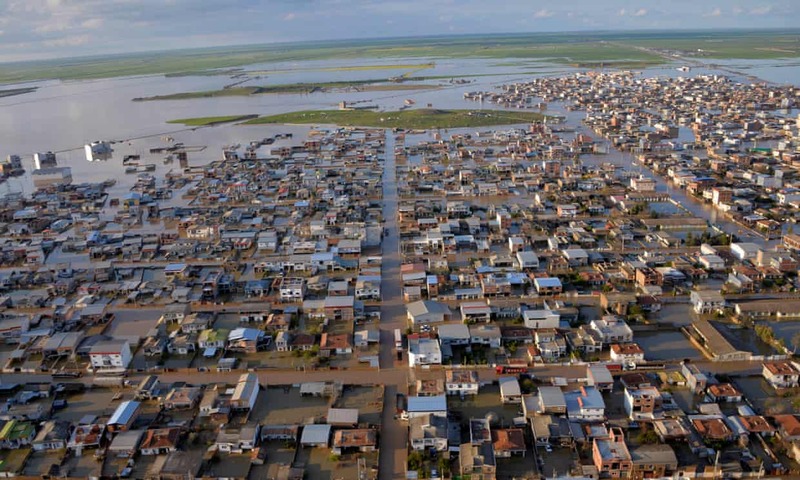 “These floods once again show the level of Iranian regime mismanagement in urban planning and in emergency preparedness,” he said in a statement that offered condolences and made an offer of aid, but with no details. Inside Iran, the crisis has exposed tensions between the reformist president, Hassan Rouhani, and his hardline opponents including the Islamic Revolutionary Guard Corps (IRGC), with the two camps launching public attacks on each other over management of the floods and their aftermath. The disaster has also fuelled public anger, particularly in areas where rescue and aid services have often been slow to arrive. In one possible attempt to dampen protests, the governor of a northern province was fired for failing to return home from abroad to manage the crisis. The flooding, which began in late March, has turned the normally joyful Persian new year, or Nowruz, celebrations into a time of mourning, deprivation and fear for many Iranians. The devastation has not been limited to one corner of Iran; the north-east was hit first and then, with the country still reeling, the south-west was also swamped. Deaths have been reported in more than a third of the country’s 31 provinces. Among the hardest hit areas was the city of Shiraz, where over a month’s worth of rain fell in a day, most of it in two intense 15-minute downpours. The scale of the damage has been so bad that authorities have banned foreign journalists from visiting the worst affected area, the New York Times reported. But terrifying videos posted on social media showed flood waters sweeping away whole houses, ripping desperate people from poles they had clung to for support and carrying cars along like children’s toys, some with people still inside. The new death toll of 62 was given by Ahmad Shojaee, the head of the Iranian Legal Medicine Organisation. The semi-official Isna news agency reported that it was based only on bodies transferred to coroners, so may rise further. Tens of thousands more have been displaced, and many may have been made permanently homeless by the flooding. But getting in relief supplies is likely to remain a challenge for months to come. Thousands of roads have been blocked or washed away and 84 bridges destroyed, making rescue operations complicated, a spokesman for the National Disaster Management Organisation told state TV. “[In total] 141 rivers burst their banks and around 400 landslides were reported,” said Behnam Saeedi, a spokesman for the organisation. The damaged roads make up about a third of the national network. Sanctions mean the country has not been able to update its fleet of rescue helicopters. The United Nations said at the start of the crisis that it was ready to offer help, but also warned that “challenges caused by unilateral sanctions will affect the UN response and the accountability of UN to deliver the appropriate support”, the office for the coordination of humanitarian affairs said in a statement. The tepid international response is in marked contrast to the crisis after the Bam earthquake in 2003, when the world raced to offer help after the historic city was nearly totally destroyed.